What’s been going on with our shark volunteer project in South Africa? It’s not all about the sharks in South Africa. Our shark volunteer project also encompasses other marine life and their ecosystem, which are of the utmost importance to the sharks’ survival too. Whilst the main emphasis is placed on the shark boats that go out almost daily, there are also some other amazing things going on. In addition to the shark cage diving, educating and data collection, shark volunteers can also get involved in other marine projects. Updates on these can be seen below. In 2016, a sanctuary for rescued African penguins and other sea birds was established next to the volunteer accommodation. It is a state of the art facility that aims to rehabilitate and care for local marine birds that are injured, diseased or distressed. Here, these birds can be treated and rehabilitated, and finally released back to the wild when they are able once more. Twice per day, once in the morning and once in the afternoon, two volunteers can help out with the rehabilitation efforts of these injured and unwell sea birds. 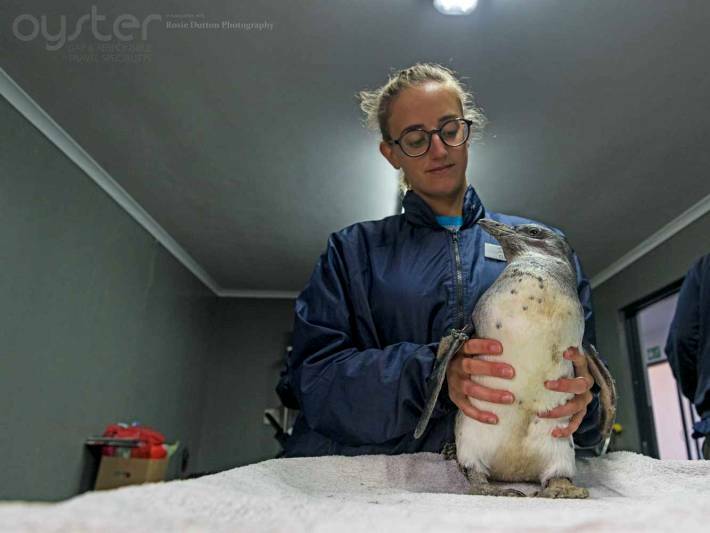 The number of African penguins is in serious decline, and this sanctuary is doing all that it can to reverse this tragic trend. Volunteers love caring for these rescued animals each day, as they can see the amazing progress that they make: from being barely able to move or feed to seeing them start to gain weight, and then finally waddle back out to sea to where they really belong. It is a moving and exciting venture to be part of. This project has been a fantastic success in 2017, and we are looking forward to getting more volunteers involved in 2018 and beyond. The shark conservation project isn’t just about seeing the sharks out at sea – it is about helping to improve their marine environment. This is also incredibly important for the other marine life in the area. Hardly a week goes by without a beach clean up, or at least the removal of fishing lines from the beaches. Fishing lines pose a real threat to sea creatures, as they often tangle around their feet or bodies, restricting movement and thus reducing their survival rates. This is a fantastic way to get out and about on this beautiful stretch of coastline, and you can really see the benefits of the work that you do. We are not sure if this should qualify as a 2017 highlight, as it was upsetting news to learn that a dead shark has been found on the rocks. However, with this discovery came the opportunity for the scientists to dissect this endangered species to learn more about it. Volunteers were lucky enough to participate in this sad but incredible day, getting stuck in with lots of measuring, weighing, cutting and of course learning. 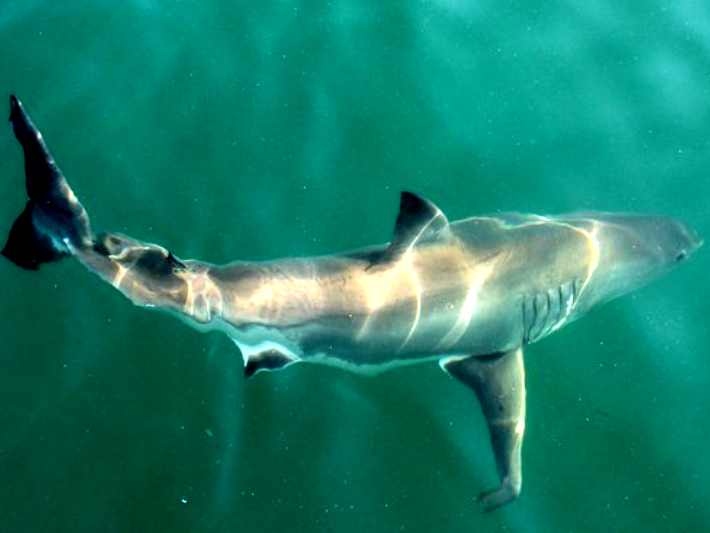 The shark was a juvenile 2.8m female. She had no tag, but she is known from the dorsal fin and tail pattern photographs that had been taken of her. The necropsy revealed that there was no obvious signs of Orca bites, and that her liver was intact. She had a fresh hook lodged in her jaw and several other injuries in that area. It is suspected that a fishing hook caught in her jaw and she and the angler both wrestled to get free. Sadly, the damage done to her was so severe that she did not make it. White sharks can easily die from stress, and when caught on a hook their hormone and electrolyte levels rise to lethal levels, resulting in death. This was tragically the 7th dead shark found in the area in 2017. The main causes of death are Orcas, poachers and careless fishing practice. This is unacceptable when great white sharks are already vulnerable. 2017’s whale season was a real success. 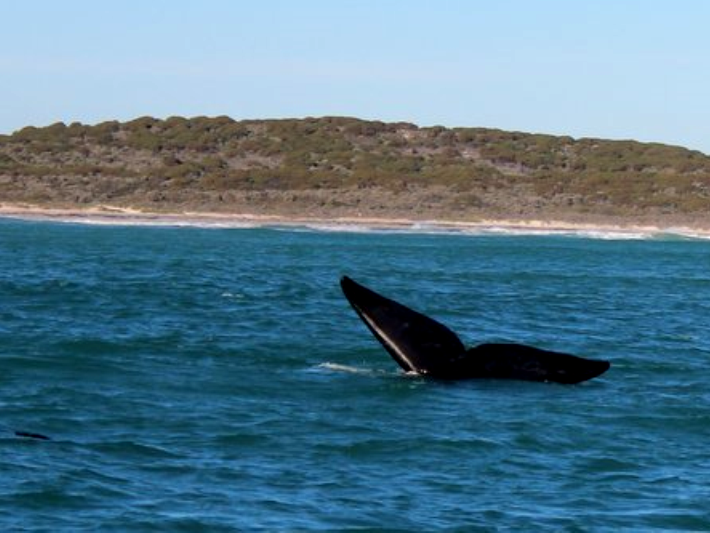 The last Southern right whales have now headed off to feed before the next winter, but the Bryde’s whales are now returning to the area. Volunteers become involved with the full processes on the whale watching boats – helping the passengers, educating ecotourists, helping others through seasickness and cleaning the vessel. Other roles include taking photographs, writing the daily blog and entering oceanographic data and sightings into the database. Why not come and see for yourself what happens on the shark volunteer project? Spaces are limited for this amazing opportunity, so do book sooner rather than later. Check out our volunteering with sharks website to find out more.